Welcome. 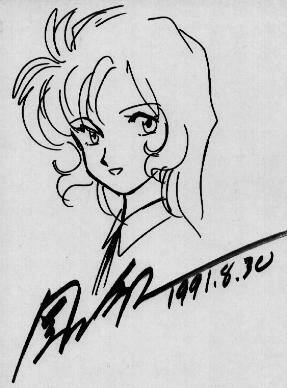 My collection highlights are original sketches by Japanese artists, original sketches by animation artists for American studios, a sequence of animation drawings from Nadia (Gainax), and Bubblegum Crisis animation drawings. I have a number of modest cels from Studio Ghibli, Bubblegum Crisis and other shows. Some galleries feature manga-influenced artists such as Adam Warren. I have a link to my other art collection featuring work by comic book and comic strip artists including a Charles Schulz Snoopy drawing. My name is Steven Ng and my work is driving books around for the Alameda County Library. On my annual Summer vacation, I drive books from Los Angeles to the San Diego Comic Con for my brother's Stuart Ng Books. 4/17/2005 Following the Alternative Press Expo in San Francisco, I scanned new drawings by animation artists. Opened a Kim Possible gallery and new galleries for Adam Warren, Bill Morrison, and Bruce Timm. 8/10/2004 At Jason's invitation, I'm adding non-Japanese artwork to the site. I'm starting with drawings by animation artists I've met at conventions: Tom Bancroft, Enrico Casarosa, Ronnie del Carmen, Shane Glines, Lynne Naylor, and Chris Reccardi. You may not know the names, but they've had prominent roles at Disney, Pixar, Warners, Blue Sky, and other studios.